PAUSE/CANCEL two times to clear the display. I’ve worked on dozens of these washers and have only found the above service manual solution to apply once or twice. 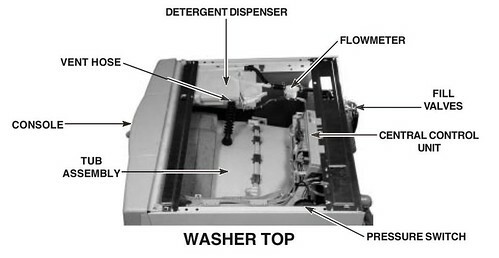 The vast majority of the time, I’d arrive and all the washer would do is drain and flash F-21 in the display. I couldn’t even get the control board to go into diagnostic mode. Anyway, I plugged the washer back in and, lo!, the washer did enter diagnostic mode and the people did sing and the Lord did grin. And there was much rejoicing. Especially after I replaced the water level switch whereupon appliantological harmony was restored. This entry was posted in Washer Repair on September 27, 2008 by Samurai Appliance Repair Man. OK, I have had the same problem as above. I took what I considered to be a conservative step, accessed the pump, removed the filter and it was (in my layman’s opinion) a mess. There were all kinds of clumps of lint in there, a quarter, a dime, hairpins, a sprinkler insert for an outside sprinkler head, all of which was removed. I then also took a wet-dry shop vac, sucked out the rubber main drum drain hose, and was able to stick my finger into the pump motor and feel the impeller. The impeller seemed to be movable with my pinky, so I did not necessarily feel that the pump was shot. I then reinserted the filter, and was able to successfully run a very short (apparent 12 minute) “rinse/spin” cycle. It ran this successfully. So, I decided to run a full load on the “normal” setting. Though I did not watch the entire load, with about 25 showing on the screen, the F21 fault code re-appeared. So, what do I do now? I noticed your remarks about the f21 code, and you seem to skip the pump replacement and go right to the “pressure switch” replacement. I have no problem with this but, how do you know which part is bad? How can one tell which to replace? I would love to go out and buy the pressure switch now, replace it and have it be done. What are your thoughts samurai? Well, you can do this easy way or the hard way. The hard way is to not read my tome carefully, skipping the mention about diagnostic mode, and babysit an entire cycle until the fault code appears. Then there’s the easy way. That would be using the tech sheet in your washer to enter diagnostic mode so you can activate individual processes, like the drain pump, and keep doing it until you re-produce the failure. You’d still use your meter at this point to make some tests but the difference is that you’ll be doing it on your time, not the washer’s time. As for the tests: first thing I’d want to find out is whether or not the pump is getting voltage (120vac) when it should be pumping out. OK, I get the slight hint of sarcasm. I do love it and of course, you are right. I am a layman here though, and I’m uncertain of what kind of “meter” you are talking about. Are you talking about a multimeter? I have a really good Greenlee. Would this be sufficient? Also, from the tech sheet, do I enter “Diagnostic Test” (automatic) or “Manual Diagnostic Test”, or what? Also, I ran another drain/spin cycle this morning prior to reading your response. The cycle wanted to finish, did not however, and I got a “SUD” error code now. Does this help you lean toward faulty drain pump/motor or Pressure Switch? By the way, when underneath the washer with the front lower panel removed, I actually heard the drain motor (and felt it) turn on. So, what else if any can you tell me “oh grand master Samurai?” Look forward to your insight. Just wanted to drop you a note to let you know that, after doing what I usually do with such matters, I took a deep breath, took a step back from the problem, then retraced the steps outlined in above and in my technical manual. I asked myself if I “…cleaned out all the lines…the long drain line, the pump itself, double checked the impeller, and the short (black rubber corrugated flexible tube leading directly from the wash drum into the pump/motor assembly.” In short, I finally decided to remove the pump/motor assembly. In so doing, I had to disconnect the long drain line (which I stuck some electrical fish tape through just to make sure it was clear.) Then, I took a very good hard look into the black rubber drum drain tube. Low and behold, this thing was so clogged up with junk I could not believe it. There was all kinds of matter in there none the least of which was an entire sock. There was also a bunch of coins, paper clips, hair, hairpins, etc. I had to use long nose pliers to get the stuff out. So, for all your readers out there, it may very likely pay dividends to follow the tech manual suggestions first, clean EVERYTHING. This will payoff. If, and only if, everything has been cleaned out, then you try to run a test (or in my case, a test load). As it turned out here, everything is back up and running perfectly. These things don’t just go bad for no reason. Wires and/or wiring harnesses or “molex” connectors do not simply come undone on their own. Check them. It is basic detective work. Help yourselves. The Samurai is right. Follow the “easy” way. I was lucky that I was around to see what was going on at the very beginning. Otherwise, these things clogging up the machines inner parts could have caused a burnt out pump/motor assembly (approx $120-140), or ruin the pressure switch (approx $50). As it is, I will now have to keep a close eye on each of these to make certain that they do not prematurely expire. Thanks for being there Samurai. Your professional advice was invaluable. I really appreciated having you there. Good day. A couple of comments to help your grateful “listening” audience. The above advice applies as well to the Kenmore Elite HE3 washer (model 1104282201) in case anyone is doing a search thereunder. However, and more importantly, I learned yet another fix for this same series of errors/problems AFTER replacing the pressure switch valve and it not fixing the problem. I disassembled all the panels to get a really good look (okay, okay, I should have done that before I ordered the part). Anyhow, the tube from the pressure switch valve leads to the tub itself, but first passes through a sort of plastic chamber that itself is bolted to the frame holding the tub. In my case, the plastic chamber was just chock full of oily goop that essentially formed a plug blocking any air flow. So, as the tub emptied, the pressure never changed in the pressure control switch and therefore never “told” the controller the tub was empty. Solution – take the darn thing off and clean it out, put back. Cost – zero dollars. I guess the silver lining is threefold: (a) a new pressure switch, (b) a learning experience and (c) extra beer money saved by not having a professional clean out a gunk trap. Many thanks for your work and your website. Beer money (modest amount, sorry) on its way. My whirlpool duet is driving me crazy. I cleaned out the filter machine worked well for a few loads then right back to F-21. Changed pressure switch ran great for a few loads then I washed one jacket and I got F-21 and it will not drain. Please help. Just wanted to drop a note to say thanks for the help and advice on this board. I registered to just say thanks. Dug the following out of the filter in line and just upstream from the pump: 8 quarters, 22 dimes, 7 nickels, 16 pennies, 1 small screw, 1 small nail, 1 concrete nail and a crap load of lint. Thank goodness the impeller is ok. Hopefully removing the filter and cleaning it out does the trick. Happy New Year and thanks again!